This is a rectangular flange Buck’s Brilliantene Oil porcelain sign. 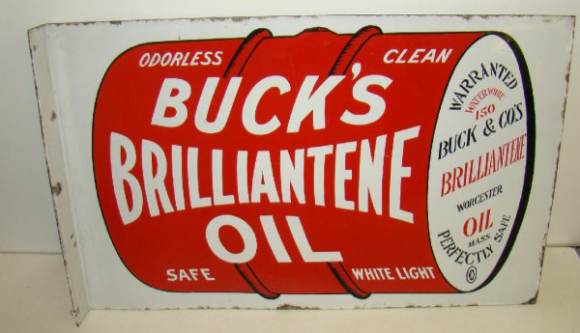 This particular Buck’s Brilliantene Oil sign features a large red barrel against a white background. It reads, “Odorless Clean Buck’s Brilliantene Oil, Safe White Light, Warranted Buck & Co’s Brilliantene Oil, Worcester Mass, Perfectly Safe”.